Bill Keys operated the Wall Street mill, which was originally owned by F. Morgan. When Morgan died, Keys filed on the property for back wages. Keys continued to operate the mill processing ore from his Desert Queen Mine and for other prospectors receiving a percentage of the amalgam. The Wall Street Mill is of local technological/mechanical significance under the general category of Industry. The significance is due to the fact that it is a complete and operable gold ore crushing mill featuring late-19th Century two-stamp mill machinery. Consequently the significance encompasses the mill machinery, the building which houses it, the well which supplied water for the mill's operation, and the well pump. The stamp mill buiilding is framed with heavy timber and built on a downward sloping hillside to take advantage of gravity in the milling process. The roof and some of the exterior walls are covered with corrugated sheet metal, while some of the exterior walls have either vertical or horizontal wooden siding. 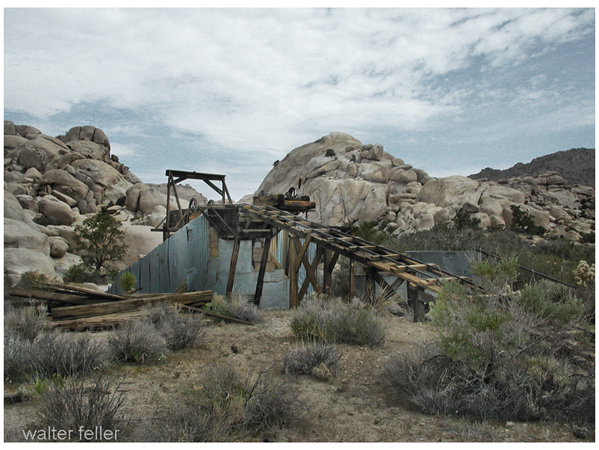 At the top of the building a long wooden ramp supports the track of an ore tramway which carried ore from where it was unloaded from trucks to the top of the mill above the two-stamp Baker Iron Works crusher. A gasoline engine powered the mill; it was built by the Western Gas Engine Company of Los Angeles under patents dated 1906. It had a speed of 340 revolutions per minute. A Myer concentrating table was used in separating the gold from the ore. There are a few stone masonry walls that function as either retaining walls or foundations for walls. The overall size of the structure is approximately 25' wide and 50' long and has three levels: ore crusher level, intermediate level and amalgmation table level. There are two metal water storage tanks located just outside the northeast corner of the mill structure, with a 2" metal pipe leading to the nearby well. There is a wooden platform approximately 4' by 6' at the base of the ore tramway.